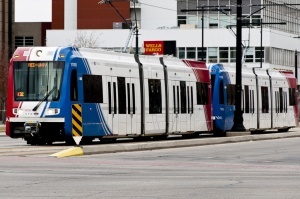 UTA TRAX is a light rail system serving parts of Salt Lake City and other surrounding cities. All lines operate every 15 minutes on weekdays and every 20 minutes on weekends. Before boarding the trains, buy your train ticket from a ticket machine or pay fare with a contactless credit/debit card (by tapping on a reader at the station before boarding and after exiting). 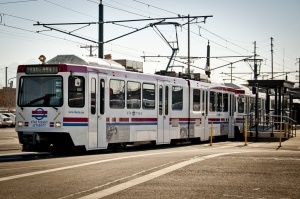 TRAX uses the proof of payment system and passengers caught without a valid ticket or pass are subject to eviction and/or citation. The doors are not opened automatically when the train is stopped at the station. Riders need to press the green button by the train door to open it. For the older high floor S100/S160 cars, bicyclists must board through the front and rear doors of each car in the train (excluding the car end directly behind the train operator). Look for the bicycle symbol on the door and on the platform. Cyclists are not permitted to board and exit through the access ramp. For the newer low floor S70 cars (which includes the streetcars), bicyclists board through the center doors of each car in the train. Bicyclists should store their bikes at the designated spots located towards the center of the car. Select cars have designated racks where bikes can be hooked to and stored. Bicyclists must stand with the bicycle at all times. If the train is too full, you may need to wait for the next train. Bicycles must not block doors, aisles or stairways on the train. No fuel powered vehicles are allowed on the train. TRAX is accessible to people with disabilities at all stations. There are two types of trains (high floor and low floor). High floor trains operate exclusively on the Blue Line seven days a week. The low floor trains run on the Red and Green lines at all times. To board the high floor trains, riders in wheelchair or other mobility device should wait on the access ramp by the forward end of the platform. To board low floor trains, riders in wheelchair or other mobility device should wait on the main platform and board through any of the two center doors of each car. Push the blue button on the train door to open the door and deploy the boarding ramp (the rider needs to move back from the platform and ramp extends). This page was last edited on 12 November 2018, at 14:32.